Caroline Ross photography offers wedding albums in a variety of sizes and include custom stamping on the front of the album. The pages in the shown album are soft and include 100 pages. Additional pages, up to 300, are available. Hard pages are also available, with a maximum of 80 pages. Soft pages are preferred for the large amount of images the album is able to fit and the simple layouts achieved when you have lots of pages to work with. Matching clamshell cases are also available, and come included in the bride and groom's album. Caroline Ross photography offers beautiful hand made linen covered flash drive boxes with all the final images from your wedding day. All the images on the USB (up to 1600 images) have been fully edited and are ready for print. 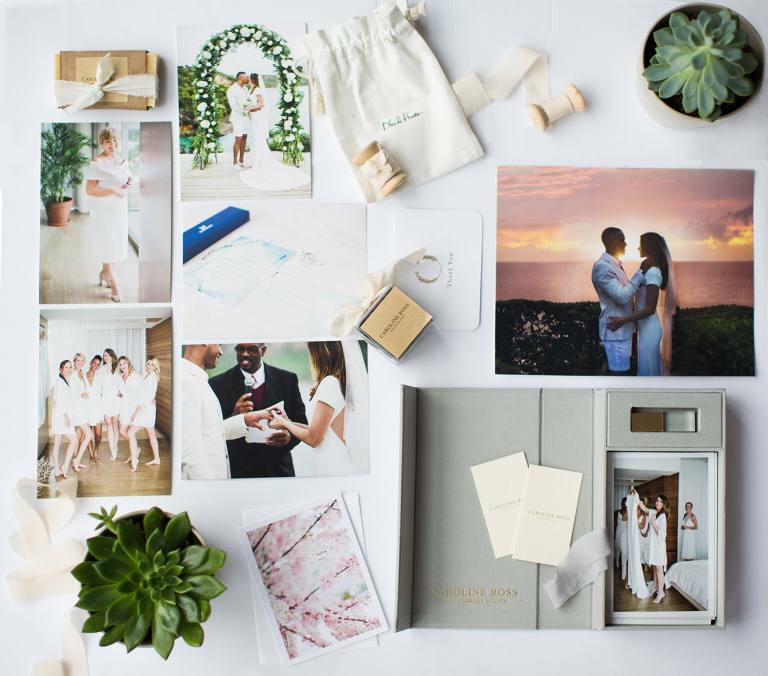 The couple also gets an additional 100 images to have extra editing on them (fixing hair, teeth whitening, skin blemishes and the odd bald spot), and those images are printed out on archival paper and added to the USB box.